Delaware Christian senior Hannah Maurer (center) looks for a pass in the Eagles’ scrimmage against Grove City Christian last week. The DCS girls basketball team opens at home Friday at 6:30 p.m. against Centerburg in non-league play. 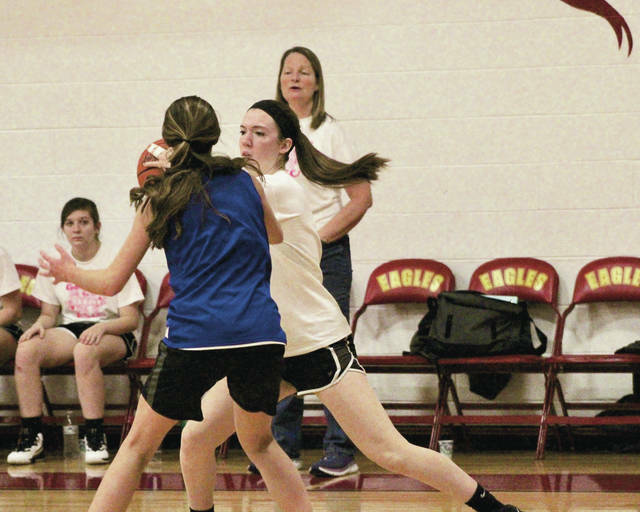 If there’s one thing the Delaware Christian girls basketball team has shown in the early part of the of the preseason – it’s eagerness. Eight of the 10 players on this year’s squad played volleyball in the fall. The volleyball team made a run in the tournament before falling in the district final Oct. 27 one day after coaching was allowed to begin for basketball. So, it’s a good thing Jackie Boggs coaches both sports … because she had a plan. She told her volleyball players to show up Oct. 31, a Wednesday, for a light shootaround. But when she came to the gym Oct. 30 to work with non-volleyballers Rachel Fisher (junior) and Katie Neuhart (freshman), everybody else showed up, too. So, despite her best intentions – they got to work. The Eagles had to rely on Lyssi Snouffer for a lot of their offense last season. Snouffer averaged 24.4 points and 18.8 rebounds per game for DCS, which finished 12-10 and 7-5 in the Mid-Ohio Christian Athletic League. “I really feel like we can contend for the (MOCAL) title with what we have,” Boggs said. Boggs believes there are some pieces to help take the load off Snouffer this year. Boggs has a couple of freshmen that could make an impact for the Eagles this season in Neuhart and Emma Rindfuss. Hannah Maurer is back for her third season on the varsity level and is the team’s only senior. Juniors Abbi Maurer and Fisher and sophomores Erin Bauslaugh and Nikki Sneddon return from last year’s squad. Freshman Abbey McKee rounds out the roster. Boggs said she’s only been playing for a couple of years. She’ll bring energy and provide depth for the Eagles. DCS opens the season at home Friday night against Centerburg in non-league action. Tipoff is scheduled for 7 p.m.